Not since the advent of the television ad in 1941 has the potential for new ad formats been so great. The emergence of digital platforms is enabling marketers to experiment with a number of new ad formats, each of which could revolutionize marketing as we know it. Throughout 2014 we will be highlighting the most effective of the techniques being broadly adopted. Music has been a fundamental ingredient of television ads from its earliest days. When used to set the tone, break through the clutter, or provide continuity within campaigns its presence is proven to improve ad performance. But exactly how much of a difference can music really make? 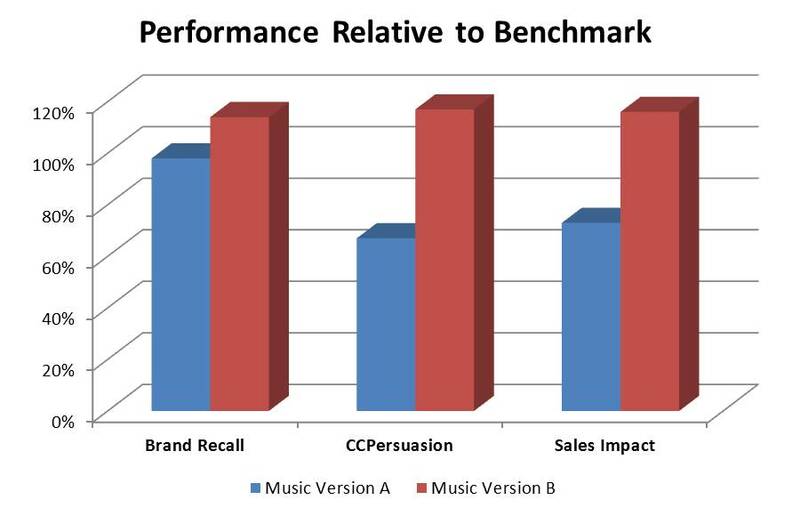 The below table shows the results for two versions of an ad with the same visuals and spoken tagline, only the music was different between the two. Yet this single difference changed the ad from a below average performance to an above average one. In its most refined form, music can even elevate itself from being the added spice within an ad to being its primary course. While these “music ads” have been rarely used in the past they are now a mainstay advertising format for both the television and online media channels. Especially when targeted to the MTV generations (X & Y), the modern music ad has taken on aspects which make it distinct from those of the past. One of the most striking differences is in the type of brand associations created. In its traditional form the music ties the brand to specific benefits by highlighting brand features in the lyrics. In the modern form, the music ties the brand to specific emotions by highlighting personal experiences. For example, contrast these two ads created 60 years apart. While they use many of the same visual devices the music in the first links the brand to the benefit of being able to see the country while the second links the brand to deep-seated feelings of desire. Another difference is in the immersive quality of the ads. While both the traditional and modern forms cast the brand as the enabler to an experience, the modern ads take advantage of new production techniques gleaned from video games, home theater, and immersive cinema. By analogy, if the traditional approach casts the brand as an orchestra, the modern approach casts the brand as a dance partner. A new role which has emerged for music ads is in bringing new consumers into the brand fold as they enter the market. Since each age group adopts music styles as their own, the use of contemporary music can help make the brand relevant to these new consumers. When handled with care, the brand heritage can be maintained in this process with the music acting as bridge over the river of time. Another application of the modern music ad is in tying a brand tightly to the equity of music celebrities. Celebrity endorsements are among the oldest vehicles for building positive brand sentiments. But since the early 2000s there has been a marked increase in the use of musician alignments with beauty care brands. In these cases the music ads have the potential to move a simple endorsement to an emotional intertwining of the brand with the performer. As long as music remains an important part of our cultural identities, we can expect advertisers and their creative partners to invent new uses for the music ad format.